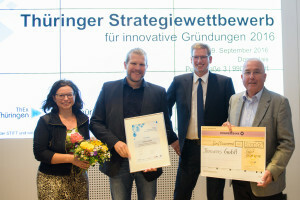 For the fifth time the awards ceremony of the Thuringian contest for innovative startups was pending. And this year it was held in the beautiful new Dompalais Erfurt. With this competition the ThEx‘ (Thüringer Zentrum für Existenzsgründungen und Unternehmertum) aim is to recognize outstanding attainments from company’s founders and thus to create a culture of independence and promotion for entrepreneurship in Thuringia. This year nine startups have participated in this famous contest including Ilmsens. There have been three equally ranking winners this time – and guess who nailed it! We have been aiming for the best – and took the award back home! The prizes for the winners were endowed with 5.000 € each and given to the winners in the awards ceremony which was held in a small frame of 40 people consisting of companies, investors, representatives from business and influencers. After a short welcoming speech from the state secretary Maier as well as two founder stories that rounded off the evening the intense evening networking began. It was a wonderful evening with lots of positive experience and pleasant people. At this point we would like to thank the judges for the selection and the massive support from ThEx and congratulate all the other award winners!